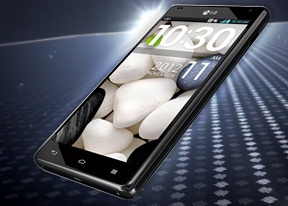 The LG Optimus G is powered by Android 4.0.4 ICS with a planned upgrade to Android Jelly Bean later on. The Optimus UI on top of ICS runs deep and adds tones of optimizations including choosing themes, changing the look of icons, choosing between a static or swipe-able wallpaper, etc. The Android 4.0 interface is sprinkled with some extra little touches that really make using the UI an enjoyable experience. Those are small tweaks that pop up here and there will surprise you with their usefulness. We'll be sure to point them out to you as we go along. Now, let's get started with a video demo of the flagship Optimus G in action. LG has updated the cool swipe lockscreen, which lets you see what's "underneath" as you unlock the phone. Now, by default swiping a finger at any spot of the lockscreen creates a magnifying glass effect, showing you what's underneath as if you're looking through a rain drop. You can also place up to four shortcuts that will unlock the phone straight into an app. You can change the lockscreen clock style as well as the four icons at the bottom with whichever app you choose. That's how it should be done - in HTC's Sense for example, the lockscreen shortcuts always repeat the homescreen shortcuts. While we're at it, the shortcut bar at the bottom of the homescreen is one of the major changes in the Optimus UI. It can now fit up to 6 shortcuts and that's one more than what TouchWiz offers on the Samsung Galaxy S III. You don't have to use all available slots though - you can discard all but the App Drawer shortcut if you want. As usual, the shortcuts are always visible on any of the homescreen panes. With the exception of the app drawer shortcut, you can rearrange, delete or replace any of these with shortcuts of your choosing, even folders. We like the bright color themes and the white system menus, which look very nice on the HD screen. Many aspects of the phone's behavior can be customized, you can go to as small detail as the capacitive key backlight and the transition effect between homescreen panes. The LG home-backed tweaks and enhancements are by no means limited to the visuals. The Q Slide option makes it possible for you to watch a video while using other apps, while the system-wide QuickMemo integration allows you to take a screenshot anywhere in the phone and take notes over it. With the Optimus G LG has also added a landscape mode for the homescreen, which is useful given the 16:10 4.7" screen. You can resize widgets (Ice Cream Sandwich also allows you to resize most widgets, if you want them to take up more or less space) or you can even shrink a widget down to the corresponding app's icon. LG have also added a pinch of Jelly Bean to the ICS Optimus UI - if you move a widget over icons they immediately move out of the way, which is really neat. Adding stuff to the homescreen is done by tapping and holding on a blank area of a homescreen. A context menu appears, allowing you to add various customizations to your phone. The tabs along the bottom let you select the appropriate app, widget or wallpaper, which you can add to the homescreen of your choice. Gridlines will appear when you hold and drag an app or widget, allowing you to easily place it on the homescreen. If a certain icon isn't to your liking you can always change it to whatever you prefer. There's a wide choice of different icons and you can even choose to make one of your own. The contextual menu is accessed the straightforward way - just hit the menu button. LG has also enabled a ton of other customization to the the homescreen looks and behavior. There's a dedicated setting for looped homescreen scrolling and the so-called screen effect changes the transition effect between homescreen panes. The notification area was also been tweaked by LG to allow you to rearrange the toggle buttons shown there. You are also free to add and remove toggles from the edit menu. You can add an insane amount of shortcuts here, but don't worry that they won't fit on the screen - the row becomes side-scrollable so you can still access them all. As usual, if you've got a music track playing in the background, quick controls will show up here. You can also drag notifications to the left or right to dismiss them. By default you get seven homescreens to fill up with widgets and shortcuts, but you are free to delete any that you don't need to speed up navigation. You can also set the default homescreen to any of the panes. The task manager on board is of the of the ICS variety, which shows you all of the currently running apps, and lets you stop them by swiping them to the left or right. It is accessed by holding down on the hardware home button. On the Optimus G, LG has added four icons at the bottom, which allow you to quickly open up a particular app or even stop all apps simultaneously. Finally, there's a shortcut to the task manager. LG's task manager lists the currently running apps, but also lets you uninstall apps and gives you info on your storage. It comes with its own dedicated widget, which shows a graph of the available RAM and conveniently offers a button to clear up memory. The app drawer lists all your available apps and widgets, with a dedicated tab for user downloads. There is a button in the top right corner, which triggers edit mode and lets you to easily reorder and uninstall applications. You can opt to make the icons in the app drawer smaller too. If you select an app whilst in edit mode, a pop up will let you see information like RAM usage, etc. Although styled differently (icons, colors, etc. ), the settings menu of the Optimus G is your run of the mill Ice Cream Sandwich menu. It does feature some interesting extras, however. Eco mode lets you choose what Google finds a more low-key approach to managing your CPU, which in turn reduces battery consumption. LG borrowed a trick from Samsung's TouchWiz and implemented its own version of Samsung's Smart Stay - called Wise screen. It uses the front-facing camera to detect if you're looking at the screen. Thus you can browse the phone for hours on end without it auto-locking itself. We can confirm that the feature works very well.